Tiitu Takalo (born in 1976) is a comic artist, visual artist, illustrator and feminist. She has graduated from the degree programme in fine arts at the Tampere University of Applied Sciences and has also worked as a comics teacher at the Liminka School of Arts. 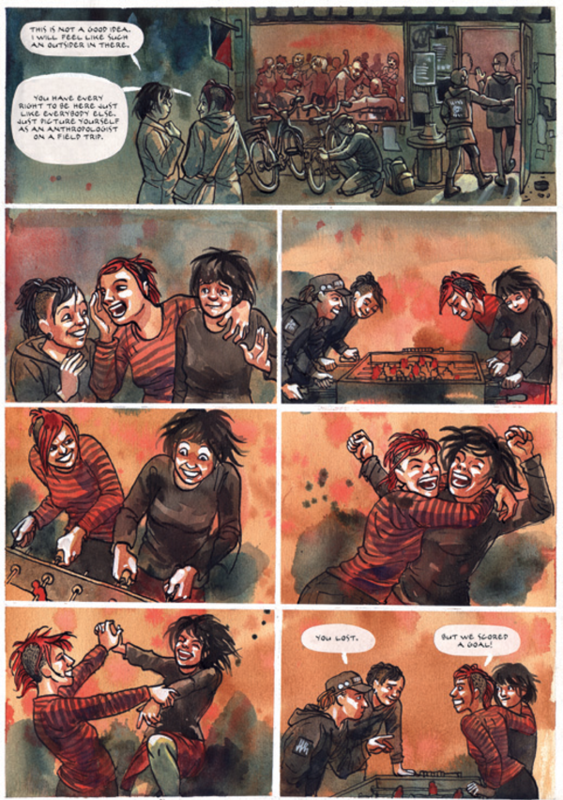 Takalo is considered to be one of the most skillful comic artists of her generation in Finland and has been nominated twice for the Sarjakuva-Finlandia comics prize. In her comics, she handles themes like womanhood, girls, relationships between people, activism, and alternative ways of life. She has a small-publishing company called Hyeena-kustannus. The most long-term and perhaps also the most important publication of Hyeena-kustannus is called Irtoparta, a magazine that was published from 2001 to 2007 and consisted of comics by female artists and authors from Finland and abroad. Her works have also been published in Finnish, Swedish and Portuguese comics anthologies as well as in various Finnish newspapers and magazines. Things that interest Takalo include friends, punk gigs, good self-determined art in all its forms in public spaces, feminist bookshops, do-it-yourself culture, and squatting houses.